Pegasus Mail is probably the electronic mail client that has been available to the public for the longest period of time (more or less 20 years), and this fact is even more incredible if we take into account that it is only designed by one person, David Harris. Pegasus Mail was available for DOS and is now available in a Windows version that is compatible with all versions from Windows 95 to Vista (it should also work with Windows 7 even though this isn't certified), including all the features of the original and adding new ones. 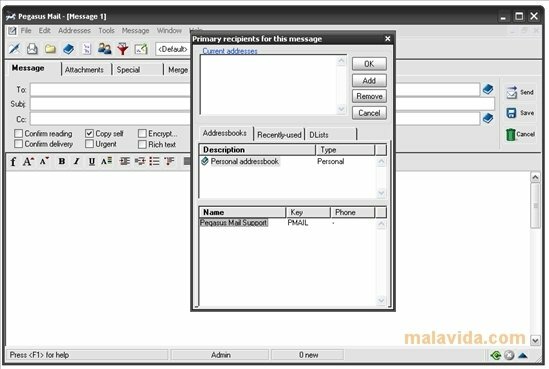 With Pegasus Mail it is possible to share the e-mail manager among various users, making things easier if you share your PC with someone. 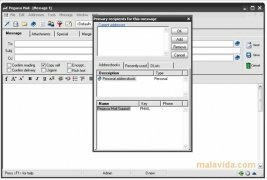 With this e-mail client it is possible to send, receive, print and view mails, as well as other more uncommon features that are equally interesting: filter manager, address book, create and administrate e-mail lists, and distribution. You will even be able to write a message to send it to a mobile phone without leaving Pegasus mail. Due to all these facts, Pegasus Mail is considered a very good electronic mail client.